Our Secret Sun All Natural Sea Salt is so pure with exceptional taste that we have patented the process! We are simply extremely patient and let Mother Nature do her magic, harnessing the sun and wind to produce a clean, ideal salt to suit all of your regular sodium needs. 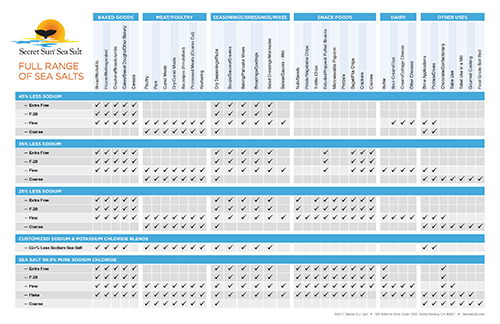 View our product application chart. Description: SHS 100SSXF (35) Sea Salt is high purity, food grade salt, produced naturally by our exclusive and patent process called SALTING OUT. This salt is obtained by the difference of density of the two brines. Organoleptic properties: SHS 100SSXF (35) Salt has a characteristic salty taste. Additives: Yellow prussiate of soda as anticaking agent 10 ppm Typical, 13 ppm max. Free Flowing agent SiO2: 5,000 ppm max, Typical 2,500 ppm, 0 ppm min. When this salt is incorporated into a food product, this additive is considered incidental, non-functional and exempt from label declaration in accord with 21CFR 101.100(a)(3). Applications: Intended for a variety of food processing applications, including baking, soups, cheese manufacturing, meat processing, seasoning and prepared mixes. Non-food application includes acting as carrier or a chemical and bulking agent in many household and personal care product. Packaging and storage: SHS 100SSXF (35) is available in 50 lb., polypropylene bag. Chemically stable, Minimum cakefree life is 5 years when stored in a cool, dry area, relatively free of drafts, where humidity does not cycle through 75%rh. Other Properties: SHS 100SSXF (35) is free of allergens, and exhibits virtually no microbiological activity; Certified Kosher; Non-GMO; also available as Organic compliant with alternate anticaking agent. Description: SHS 100SSF20 Sea Salt is high purity, food grade salt, produced naturally by our exclusive and patent process called SALTING OUT. This salt is obtained by the difference of density of the two brines. Organoleptic properties: SHS 100SSPF20 Salt has a characteristic salty taste. Additives:Yellow prussiate of soda as anticaking agent 10 ppm Typical, 13 ppm max. When this salt is incorporated into a food product, this additive is considered incidental, non-functional and exempt from label declaration in accord with 21CFR 101.100(a)(3). Other anti caking agents are available. Packaging and storage: 100SSF20 is available in 50 lb., polypropylene/paper bag. Chemically stable, Minimum cake-free life is 5 years when stored in a cool, dry area, relatively free of drafts, where humidity does not cycle through 75%rh. Other Properties: SHS 100SSF20 is free of allergens, and exhibits virtually no microbiological activity; Certified Kosher; Non-GMO; also available as Organic compliant with alternate anticaking agent. Description: SHS 100SSF Sea Salt is high purity, food grade salt, produced naturally by our exclusive and patent process called SALTING OUT. This salt is obtained by the difference of density of the two brines. Organoleptic properties: SHS 100SSF Salt has a characteristic salty taste. Additives: Yellow prussiate of soda as anticaking agent 10 ppm Typical, 13 ppm max. When this salt is incorporated into a food product, this additive is considered incidental, non-functional and exempt from label declaration in accord with 21CFR 101.100(a)(3). Packaging and storage: SHS 100SSF is available in 50 lb., polypropylene bag. Chemically stable, Minimum cake-free life is 5 years when stored in a cool, dry area, relatively free of drafts, where humidity does not cycle through 75%rh. Other Properties: SHS 100SSF is free of allergens, and exhibits virtually no microbiological activity; Certified Kosher; Non-GMO; also available as Organic compliant with alternate anticaking agent. Description: SHS 100SSL Sea Salt is high purity, food grade salt, produced naturally by the natural evaporation of seawater from the Pacific Ocean. Sun and wind evaporate seawater, leaving crystals which are skimmed from the surface of solar ponds in salt field. Organoleptic properties: SHS 100SSL Salt has a characteristic salty taste. Delicate flakes of pure sea salt which dissolve instantly when sprinkled on food. Applications: Intended for a variety of food processing applications, including baking, Soups, cheese manufacturing, meat processing, seasoning and prepared mixes. Non-food applications include acting as a carrier or a chemical and bulking agent in many household and personal care products. Try sprinkling them over salads, grilled meats and fish, pasta or any other dish to heighten its flavor right before serving. Packaging and storage: SHS 100SSL is available in 50 lb., polypropylene bag. Chemically stable, Minimum cake-free life is 5 years when stored in a cool, dry area, relatively free of drafts, where humidity does not cycle through 75%rh. Other Properties: SHS 100SSL is free of allergens, and exhibits virtually no microbiological activity; Certified Kosher; Non-GMO; also available as Organic compliant with alternate anticaking agent. Description: SHS 100SSC Sea Salt is high purity, food grade salt, produced naturally by the natural evaporation of seawater from the Pacific Ocean. It is refined by washing with clean saturated brine to remove the surface impurities, drained of excess of moisture, dried, and screened for size. Organoleptic properties: SHS 100SSC Salt has a characteristic salty taste. Applications: Coarse Sea Salt Intended for a variety processing applications, for adding the finishing touch to foods like seafood, steak, and baked goods. Packaging and storage: SHS 100SSC is available in 50 lb., polypropylene bag. Chemically stable, Minimum cake-free life is 5 years when stored in a cool, dry area, relatively free of drafts, where humidity does not cycle through 75%rh. Other Properties: SHS 100SSC is free of allergens, and exhibits virtually no microbiological activity; Certified Kosher; Non-GMO; also available as Organic compliant with alternate anticaking agent.